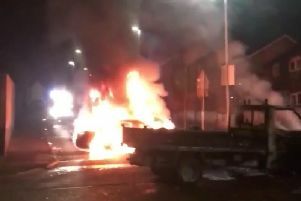 Four people arrested as part of an investigation into a bomb placed under the car of a serving PSNI officer have been released unconditionally. The three men, aged 29, 38 and 46, and a 32-year-old woman were arrested in Belfast, Derry and Pomeroy. Detectives from the Serious Crime Branch made the arrests on Thursday. An under-vehicle improvised explosive device was placed under the car of a serving police officer in Eglinton on June 18, 2015. The PSNI have now confirmed that all four “have been released unconditionally”.